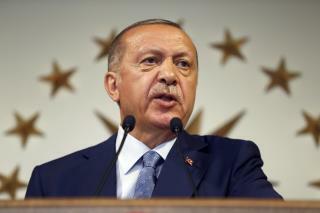 (Newser) – Turkish President Recep Tayyip Erdogan was proclaimed the winner early Monday of a landmark election that ushers in a government system granting the president sweeping new powers and which critics say will cement what they call a one-man rule. The presidential vote and parliamentary election, both held more than a year early, completed NATO-member Turkey's transition from a parliamentary system to a presidential one, a process started with a voter referendum last year, the AP reports. "The nation has entrusted to me the responsibility of the presidency and the executive duty," Erdogan said in televised remarks from Istanbul after a near-complete count carried by the state-run Anadolu news agency gave him the majority needed to avoid a runoff. The new system of government abolishes the office of prime minister and empowers the president to take over an executive branch and form the government. He will appoint ministers, vice presidents, and high-level bureaucrats, issue decrees, prepare the budget, and decide on security policies. Erdogan, 64, insists the expanded powers of the Turkish presidency will bring prosperity and stability to the country, especially after a failed military coup attempt in 2016. A state of emergency imposed after the coup remains in place. Some 50,000 people have been arrested and 110,000 civil servants have been fired under the emergency, which opposition lawmakers say Erdogan has used to stifle dissent. This result is a disaster for Turkey , for the West and the rest of the world and I am not the least bit confident that the election , polling and the whole count was in any way not corrupt . Erdogan is a narcissist an Islamist and an thoroughly unpleasant man who has jailed tens of thousands of his political opponents and mostly all of the journalists and editors who have attempted to tell the truth about him and his mafia. I also feel fairly confident that the " coup " was a put up job by him just to give him an excuse to make his supporters and others feel alright about his draconian response and the immediate changing of laws to suit him . Now he has stitched up the constitution to make himself an untouchable dictator . It does not matter which country it is, because the a$$holes are always the same, don't let the different religions, countries, and languages, fool you. And they are part of the Nato Alliance......they are more in bed with Russia.